The Smithsonian National Museum of African American History & Culture (NMAAHC) holds its grand opening today—just one week after Terence Crutcher, 40, was extrajudicially killed by Tulsa Police Officer Betty Shelby. The father of four, who was on his way home from community college when his car broke down, was unarmed and had his hands in his air when Shelby fired the fatal shot without warning. Then, just four days later, Keith Lamont Scott, 43, was shot dead by Charlotte Police Officer Brentley Vinson while waiting for his son to be dropped off after school by the bus, sparking the on-going Charlotte Uprising, which has left a second man dead. The tragedy is that Crutcher’s story is not unique; it is the very foundation upon which the United States was built. The men who wrote, “All men are created equal” are the same ones who determined African Americans only amounted to 3/5ths of a person. It has been said that, “The more things change, the more they remain the same,” and with every police killing, we are reminded of this—just as we are reminded that the United States government was found guilty of the assassination of Dr. Martin Luther King, Jr. in a 1999 trial, which the mainstream media did not cover at the time. 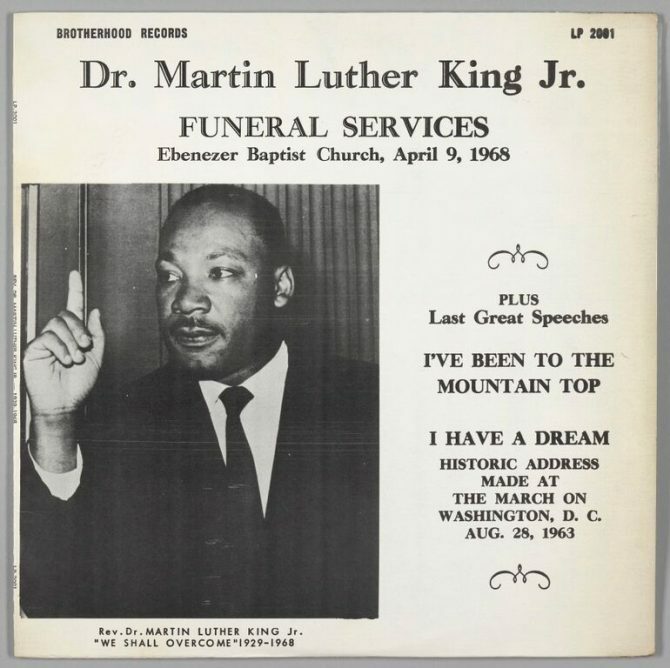 Brotherhood Records, Dr. Martin Luther King Jr. Funeral Services, 1968 vinyl , ink on cardboard H x W (2011.17.37a disc): 12 × 12 in. (30.5 × 30.5 cm) H x W (2011.17.37b album jacket): 12 3/8 × 12 3/8 in. (31.4 × 31.4 cm). 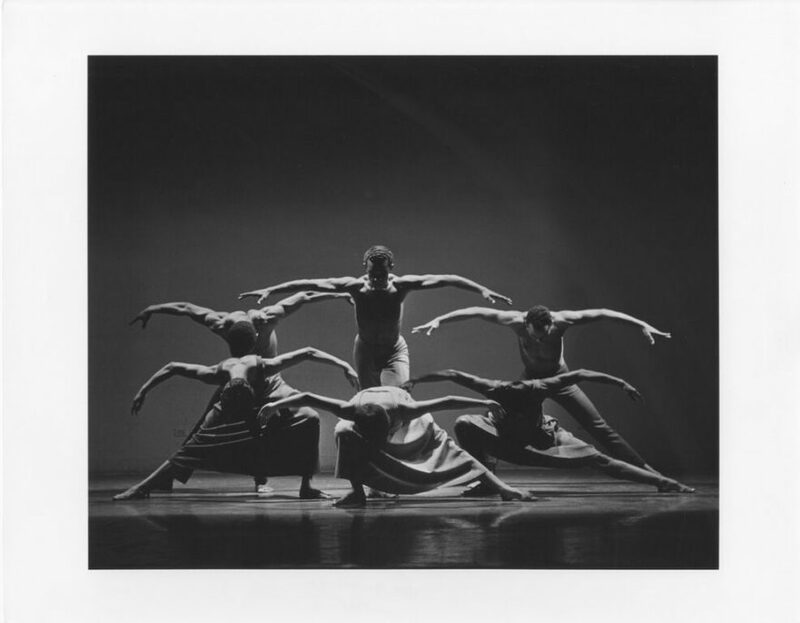 Collection of the Smithsonian National Museum of African American History and Culture, Gift of Elmer J. Whiting, III. The cognitive dissonance in this country is matched only by the inhumanity and injustice it seeks to validate in the whitewashing of a history founded upon slavery and genocide. It’s a heavy truth that so many refuse to recognize, creating logical fallacies that betray an irrational, if not pathological, mind. It has been this way since Christopher Columbus first set foot on land, and it holds to this very day despite all the advancements we have made. Yet within this torturous history, a light continues to shine, bright and bold, a light that cannot be diminished nor destroyed, for it is the light of the soul. Thirteen years in the making, the NMAAHC has undertaken a grave task, that of documenting life on earth as both heaven and hell. It is truly a museum of and for the people; its installations clear and concise as we weave our way through the 400,000-square-foot museum, passing through a series of exhibits showcase some of the most powerful and profound aspects of the African American experience. Created by: Arthur Rothstein, published by Hyperion Press Ltd. 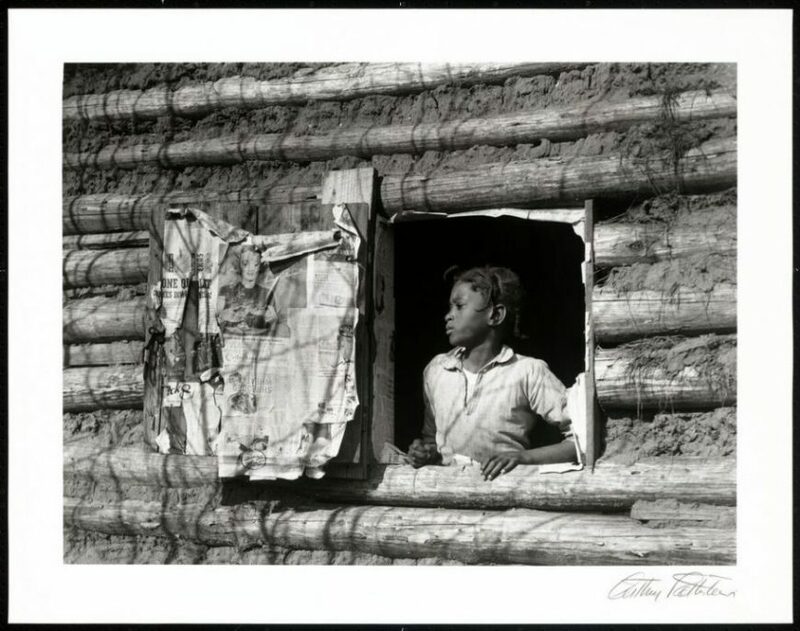 Girl at Gee’s Bend, Alabama 1937; printed 1981, silver and photographic gelatin on photographic paper H x W (Image): 8 15/16 x 12 in. (22.7 x 30.5 cm) H x W (Image and Sheet): 10 7/8 x 14 in. (27.6 x 35.6 cm) Collection of the Smithsonian National Museum of African American History and Culture. Down the elevator we go, the centuries falling away, until you return to the earliest days when Africans were brought here as slaves. The tour begins in the basement. The ceiling is low, just like the light, and visitors are greeted with the facsimile of a slave ship’s inner core. The sensation is intense; this is not merely an experience of sight but one of perception. There is a record on the wall of the ships that made the Middle Passage, noting how many boarded—and how many survived. There are Thomas Jefferson’s words from the Declaration of Independence on the wall, and then bricks underneath with the names of the enslaved people who built Monticello. Whether Martin or Malcolm, the movement lives; the trials of the past are front and center today. This past week has been one of searing pain, of a trauma that is inflicted and reinflicted so that the wound never heals. 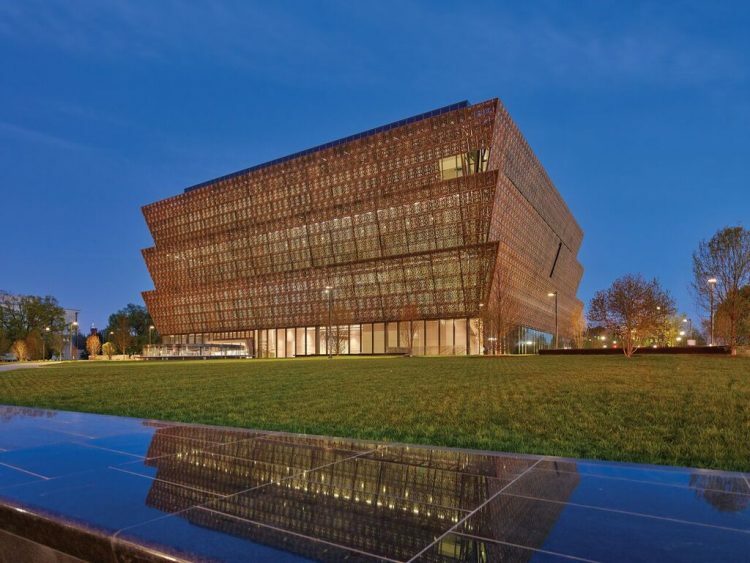 Yet through it all, there is something more: there is the soul of America as evidenced by African American culture.The NMAAHC deftly preserves this, showcasing the brilliance of African American culture and the way it has changed the game. Created by: Post Manufacturing Co. Worn by: Muhammad Ali. 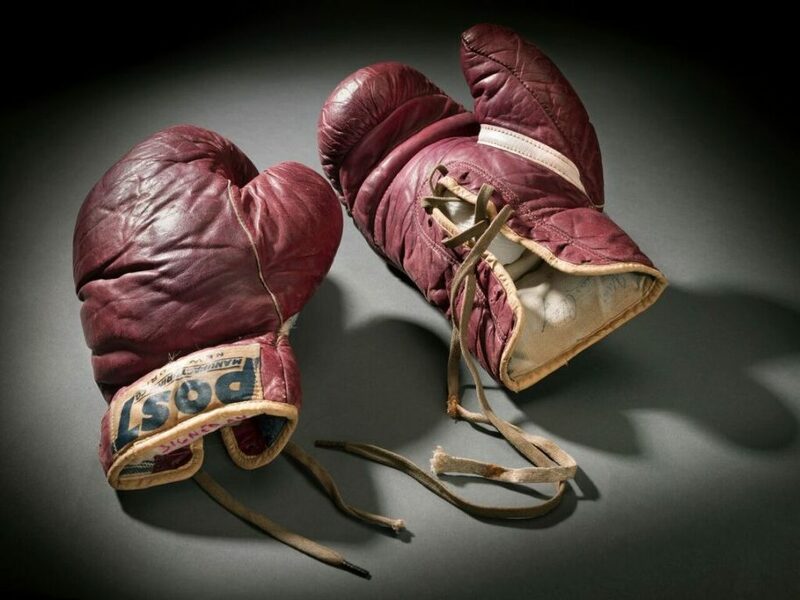 Training boxing gloves used and signed by Cassius Clay 1960. leather, cloth, thread a: 10 1/4 x 6 x 3 7/8 in. (26 x 15.2 x 9.8 cm) b: 10 1/4 x 5 5/8 x 4 in. (26 x 14.3 x 10.2 cm) Collection of the Smithsonian National Museum of African American History and Culture. —about all the what ifs. And then you remember Terence Crutcher and Keith Lamont Scott, and you know. The struggle continues.